Arrhythmias (non-normal heart rhythms) can be a challenge to understand, but with a systematic approach, diagnosis is often less difficult than it may appear at first. What is the ventricular heart rate? Cherchez le P, French for find the P waves. Do you see P waves? Leads II and V1 are often most suitable to find P waves. What is the rate of the P waves? What is the P wave morphology? What is the relationship between P waves and QRS complexes? Is every P wave followed by a QRS complex? And every QRS preceded by a P wave? What is the PR interval and does it change? What is the QRS width? If the QRS < 120ms (i.e. a narrow complex), then it is either a sinus arrhythmia, supraventricular rhythm or a junctional tachycardia. 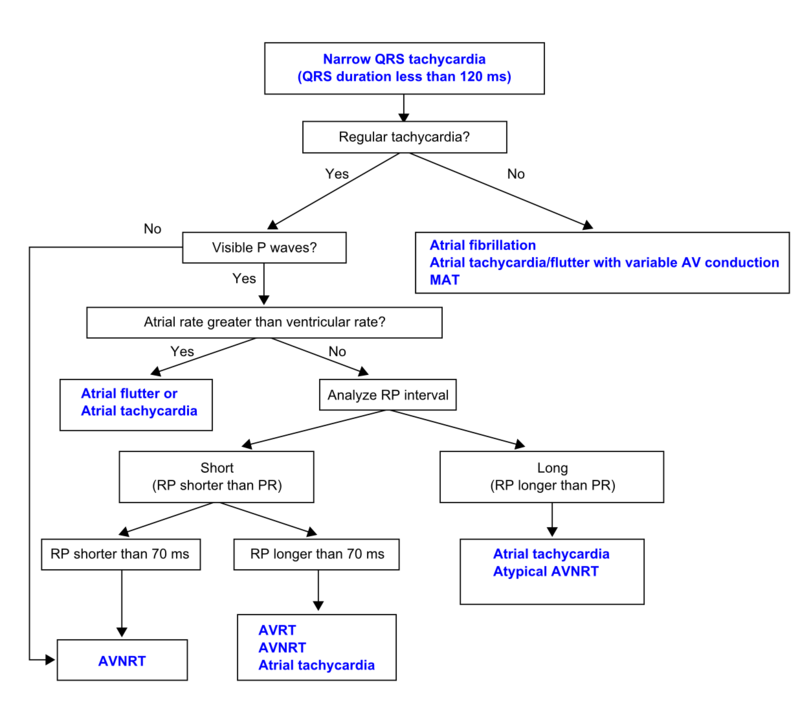 In tachycardias, this flowchart will lead to the right diagnosis. If the QRS > 120ms it is either a ventricular tachycardia or a supraventricular rhythm with additional bundle branch block. This is a challenging diagnosis. 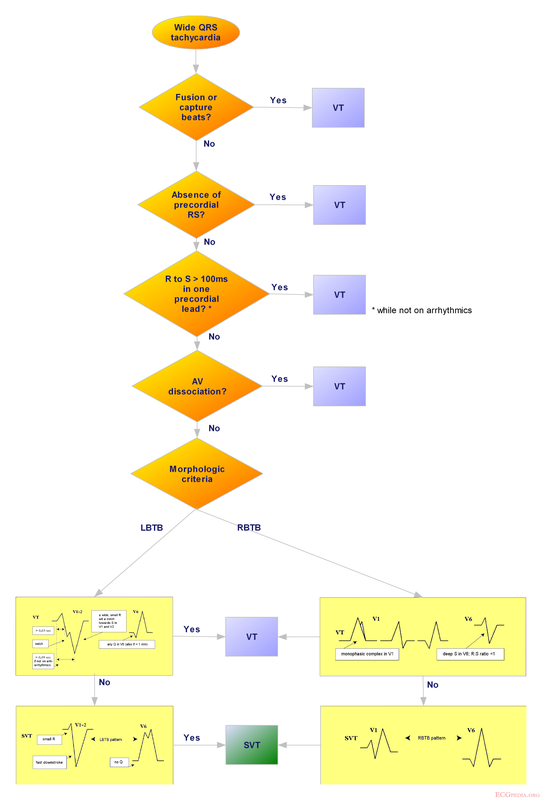 Therefore a flowchart which incoporates the Brugada criteria for VT should be used. Another method to discriminate VT from SVT has been proposed by Vereckei et al.In that paper an excellent review is given on the subject by Dendi and Josephson. What is the Heart Axis and did it change? 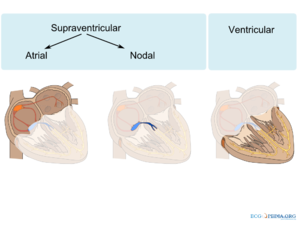 If the heart axis turns significantly when compared to the heart axis during sinus rhythm a ventricular origin of the rhythm is more likely. What is the clinical setting? A wide complex tachycardia in a 24-year-old woman with recurrent spells of tachycardia that respond to vagal maneuvers is most likely an AVNRT with aberrant conduction. This page was last edited on 3 November 2012, at 13:35.